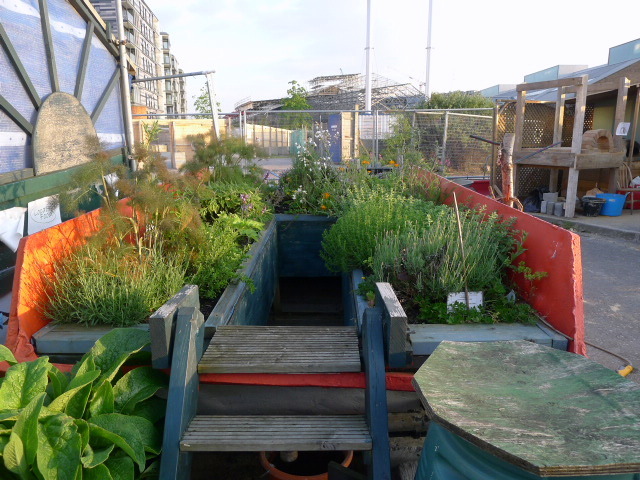 The Skip Garden was established in 2009 by Global Generation, a charity launched in 2004 whose core purpose is to inspire and empower young people to develop a living relationship with the natural world and to take a lead in generating positive environmental and social change in their communities. 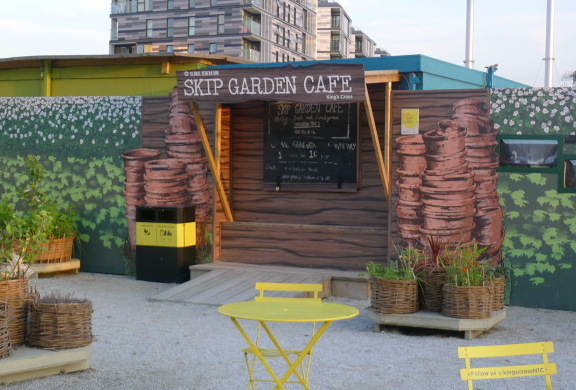 The Skip Garden is the base for the Global Generation’s youth work programme and is located within the King’s Cross development site. 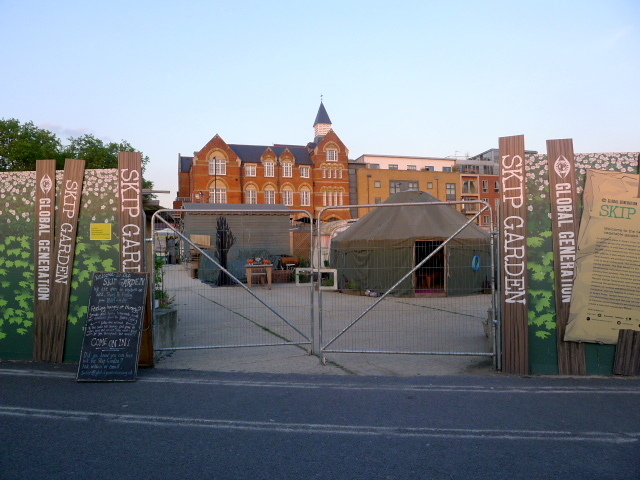 It is a portable urban garden where a variety of organic vegetables, herbs and fruits are grown out of both skips and polytunnels made out of reused materials from the surrounding construction site. It is at the garden that the young people are trained in leadership and accredited vocational business and horticultural programmes, whether it be working on the garden or building furniture. 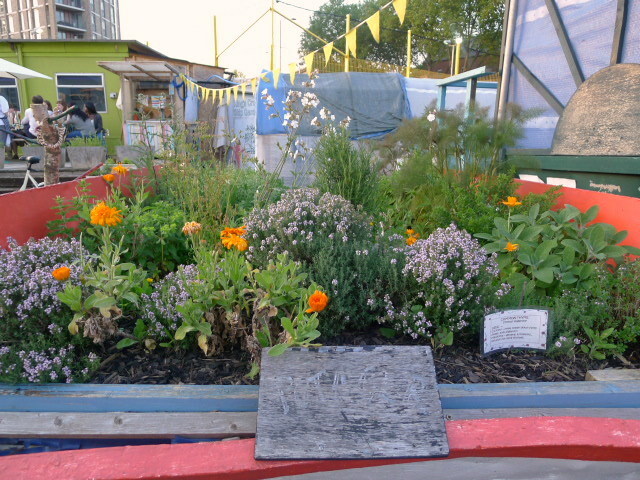 There’s also a kitchen at the Skip Garden that the young people help out with. The kitchen serves lunch from Wednesday to Friday, the first Saturday of every month, and every Saturday over the summer. The food is vegetarian and uses fresh, seasonal ingredients grown and picked daily from the garden. Skip Garden Chef Catherine Forrester invited us to a twilight dinner at the Skip Garden where we got to take a tour of the garden and to try a variety of the mains and salads prepared by the kitchen. 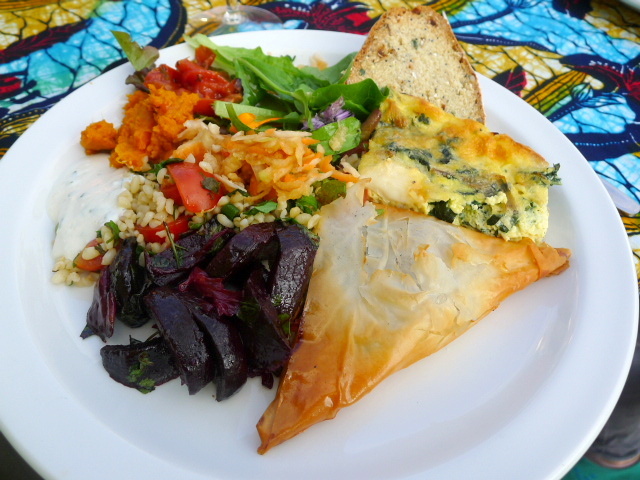 We dined al fresco to mains which included a cavolo nero and goat’s cheese frittata and chard and feta pastries. There were also salads made using produce taken the Skip Garden including greens, tomato tabbouleh, balsamic beets, sweet potato mash and a celeriac apple and carrot slaw. The food was glorious and sang loud and clear with freshness, and we got to enjoy the experience all the more as it was warm and sunny. 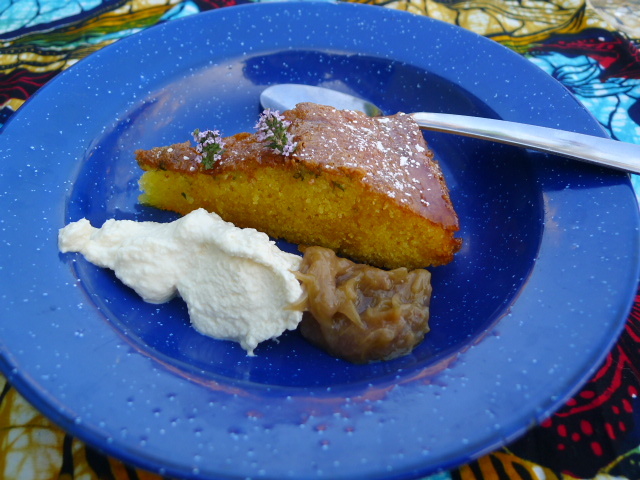 Dessert was a wonderfully moist lemon thyme and polenta cake made using lemon thyme from the garden and served with rhubarb chutney (again from the garden) and vanilla cream. The food was impressive at many levels for the not only the quality of the organic produce but also the excellent preparation. Furthermore, I was astounded to find out how reasonable the prices are. A main with two salads is only £5, and a full platter (a main, 2 salads, dips and bread) is £6. All profits made from the sale of the meals are poured back into the charitable youth programmes run by Global Generation.